In the later months of 2010 I had been producing a series of informational illustrations for Diplomat Magazine based in London. The articles have been very interesting but still very dry and needed to be some informational graphics to help explain or highlight some of the fact-based copy. Piracy off the coast of Somalia, The funding of British Overseas territories, the financial crisis in the Developing Nations and the Danube Basin Economic Region. Maybe not your first choice of reading matter but the pictures look good. New Children's clothes company 'Waddler' have approached Michael A Hill to produce wrapping paper for there online business. 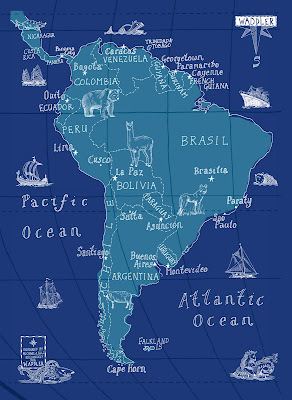 Having seen the map wraps produced by Lagom Designs they asked for something similar. The map wrap shows South America with a retro children's feel. Hopeful this will be the beginning of an exciting partnership between the two companies. "Waddler is an exciting new childrens clothing boutique and its first collection is now available online. The clothes combine European styling in subtle tones with South American textiles and traditional skills The collection includes a full body wolf suit, bombacho trousers and delicate cardigans all knitted in 100% baby alpaca wool. The designs were inspired by the three years the owners spent living in South America with their little boy"